January 22, 2019 -- While imaging is a well-recognized tool in patient care, imaging biomarkers also play an important role in the development of novel therapeutic agents. Generally, imaging-driven measures -- or biomarkers -- are used in research trials to support the rationale of therapeutic intervention and to enable objective decisions in the drug development process. When a drug combination or an advanced therapy is being applied or tested, medical imaging can reliably and noninvasively monitor short-, mid-, and long-term therapeutic outcomes, giving objective evidence of patient response to treatment. Which imaging biomarker to use in a trial depends on the stage of clinical development, specific guidance from the U.S. Food and Drug Administration (FDA), and which question needs to be answered. In early phases of drug development, imaging is needed to answer specific questions about whether the new drug candidate reaches the target and, if so, in sufficient quantity, or whether the expected mechanism of action can be observed. When a research project is at the preclinical stage, there are a number of tools that can be used to address these questions, assess biological processes, and take greater safety risks, including novel tracers for PET/SPECT, invasive techniques, and others. Imaging plays a critical role when it comes to translating preclinical biomarkers into clinical procedures. A number of innovative methodologies, including those based on artificial intelligence (AI) and machine learning, have been used in clinical trials. Finding the right imaging biomarker will allow for much faster assessment of therapeutic efficacy of a new treatment and making early go/no go decisions on whether to proceed with additional development. On average, it takes 15 years to take a drug from the lab to approval, so more information on the efficacy, safety, and mechanism of action should be sought from early-stage clinical trials to minimize late-stage attrition of drug candidates. The use of imaging biomarkers enables researchers to make objective earlier decisions on new drug safety and efficacy, reducing overall R&D timelines and costs through effective early-phase trials. The use of imaging biomarkers and surrogate end points can facilitate small group sizes, quick results, and good statistical power when assessing new drug efficacy. Imaging can reveal small, subtle changes indicative of incremental progression or regression that might be missed with traditional approaches. Imaging can also help to detect early disease and define stratified study groups. Imaging can be used to separate -- as early as possible -- responders from nonresponders in patients undergoing therapeutic intervention. Imaging biomarkers are more objective and faster to measure. When planning a clinical research trial, one must make critical choices on whether to use imaging as a surrogate end point and how to link imaging-based and clinical outcomes. At a relatively small additional cost, imaging can offer the sensitivity required to monitor drug distribution and pharmacokinetics and to image specific molecular end points. PET has been applied to a wide number of drugs to demonstrate activity in vivo, from standard chemotherapy to combination therapies addressing tumor angiogenesis and antivascularity. As an example, in the development of the F-18-labeled antifungal agent fluconazole (Diflucan, Pfizer), patients were monitored by PET to establish the concentration of the drug in different organs, particularly at the site of infection. The imaging study found that the observed concentrations compared favorably with the concentrations required to inhibit in vitro pathogen growth. MRI can also be used to evaluate dosing regimens in conditions such as multiple sclerosis, infliximab (Remicade, Centocor) for psoriatic arthritis, and PTK787 for colorectal cancer. The application of imaging in efficacy trials involves the assessment of the structural disease-related manifestations that can be visualized and quantified with a selected imaging modality; these should ideally correlate to patient symptoms and long-term outcomes. An example cited in a recent review is the development of etanercept (Amgen) for the treatment of rheumatoid arthritis. When examining the potential for etanercept as a first-line treatment, early trials used two sets of criteria: American College of Rheumatology (ACR) scores, which use a combination of subjective pain and function assessments, in addition to serum C-reactive protein levels; and conventional radiography images of joint-space narrowing and erosion. Whereas clinical scoring showed no significant difference between etanercept and methotrexate (the standard therapy at the time), the imaging-based erosion score showed differences that were statistically significant. On the basis of these data, the FDA granted Amgen marketing approval with the condition that additional supporting data be collected. A subsequent study showed that etanercept achieved sustained improvements over methotrexate in terms of both clinical and imaging scores. In another therapeutic area, Alzheimer's disease, the current gold standard comprises behavioral or cognitive measures, but these suffer from poor reliability. MRI measurement of whole-brain or hippocampal atrophy rates can be used to support clinical outcome measures in therapeutic trials for Alzheimer's disease, and functional brain activity can be objectively quantified by measuring regional glucose metabolism with PET. With clinical trials for multiple sclerosis, there has been great reliance on imaging data, especially using lesion burdens as measured on T2 MRI scans and the number of contrast-enhancing lesions. These imaging biomarkers can serve as primary outcome measures in phase I and phase II trials and also as secondary outcome measures in phase III trials. Other examples of early bioactivity assessment include MRI and CT for examining ischemic stroke and imaging assessment of cardiovascular disease. When planning a clinical research trial, one must make critical choices on whether to use imaging as a surrogate end point and how to link imaging-based and clinical outcomes. But while it takes 15 years, on average, to take a drug from the lab to approval, more information on the efficacy, safety, and mechanism of action should be sought from early-stage clinical trials to minimize late-stage attrition of drug candidates. The use of imaging in clinical trials is becoming more prominent, enabling researchers to make objective earlier decisions on new drug safety and efficacy, reducing overall R&D timelines and costs through effective early-phase trials. 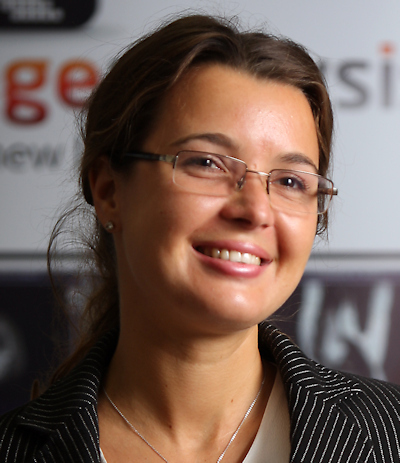 A mathematician with more than 10 years expertise in actively managing innovation in life science companies, Olga Kubassova, PhD, is a healthcare innovator and biotech investor with a passion for improving people's health. She has co-authored over 60 publications, books, and book chapters and has become a scientific adviser to the U.K. government and EU funding bodies. She is a four-time winner of national and international Entrepreneur of the Year awards. Her ambition is to bring disruptive technologies, artificial intelligence, and the best of machine learning to clinical practice and research while expanding Image Analysis Group's (IAG) footprint and partnerships. This article was adapted from one originally published on LinkedIn by the author.